What types of cases does the Municipal Court handle? Municipal Court handles criminal and traffic misdemeanor offenses, such as domestic violence, passing bad checks, trespassing, operating a motor vehicle while intoxicated, and speeding tickets. The Court also has civil jurisdiction that includes landlord tenant cases and claims where the amount does not exceed $15,000. What should I know before appearing in Court? You should be fully prepared for your Court appearance because the Municipal Court is very busy. The large case volume can make court very confusing, especially if you are not represented by an attorney. For an overview of what to do before appearing in court, please see Appearing In Court. When and where will my case be heard? Before calling the courthouse, ask your attorney. If you are not represented by an attorney, consider using this website and the Clerk of Courts website to find the information you need. For more information on how to get the information you need, click here. What if I can't make it to Court? Coming to Court should be your highest priority. A failure to appear in Court on a criminal case usually results in a warrant being issued for your arrest. In a civil case, your side could automatically lose the case for your failure to appear. To review what you should do in an emergency situation where you can not appear in court, click "Failure to Appear". If you fail to appear, these are the possible consequences. Parking around the courthouse can sometimes be difficult. Make sure to arrive early and be prepared to pay between $5-$10 depending on where you park. This website has a MAP and a page dedicated to PARKING. Why can't I see link to PDF reference in Administrative Rules as a tab in my browser? The reason for not being able to get to the referenced link that's a PDF file is due to the file being downloaded to your computer instead of showing as another page in your browser. When you see the downloaded file appear in the downloads bar, click on the the arrow next to the file and choose "always open files of this type". Why is my reference link in the Administrative Rules only showing the first page of the linked PDF file instead of going to the page that I want to view? You need to download Version 7.0 or later of the Adobe Reader to the device you're using or into Windows. A new feature in Reader 7.0 or later allows the user to go directly to a page within a PDF document. You should also enable the plugin PDF viewer in your web browser. To do this, type "chrome://plugins" in the URL of your browser. If you do not see Chrome PDF viewer as a choice for your plugins (see pic below), then you do not have Adobe Reader installed your computer. To install a Chrome viewer download here. To see where you need to check for the installed reader and it's plugin click here. If you have other browsers (e.g. Safari, Internet Explore ...), you will only need to have Adobe Reader installed on your computer. If your browser does not go to a specific page and scrolling is required, then re-install the latest Adobe Reader on your computer/device. Why can't I send a Transcript Request Form with Google Chrome as my default browser? You need to enable the Chrome PDF viewer in the Google Chrome browser. 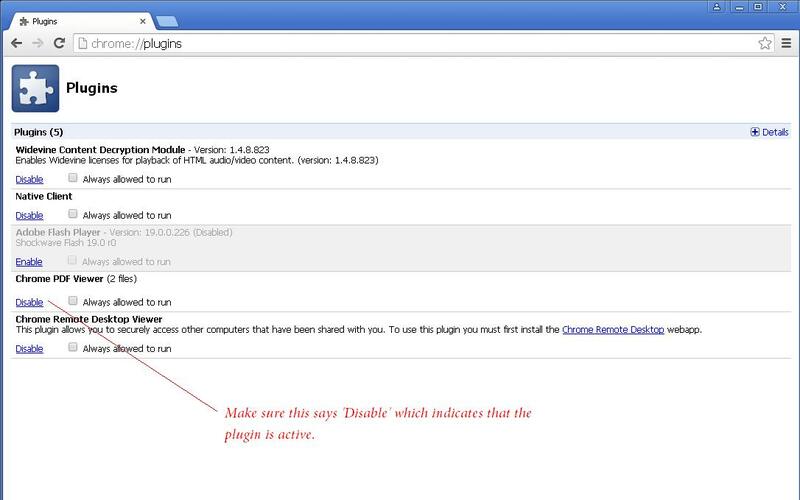 At the top of the Google browser, type "Chrome://plugins" in the URL. Click on "enable" to toggle and activate the viewer (disable should be seen). If there is no Chrome viewer installed, download here.